As Charles City school district prepared to move to one to one technology, they explored many platforms looking for the best one that would fit the needs of the teachers and students. One of the biggest wants was a platform that would allow content and information to be accessible with or without internet access. Charles City Public Schools is a very rural school division with at-risk students who have limited or no access to internet. After exploring many platforms, the decision was made to adopt OneNote Class Notebooks. OneNote Class Notebooks provides a platform for the staff and students to deliver content, communicate, and operate more efficiently. 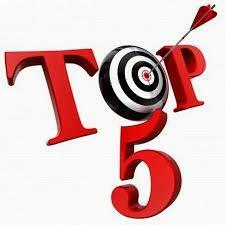 Here are the top five reasons that Charles City Public Schools (CCPS) thinks OneNote Class Notebook is the “bomb.com”. Many of the teachers dreaded having to drag papers everywhere to grade. OneNote Class Notebook took care of this issue. Teachers are able to review student work with a click of a button and record the grade right on the OneNote page. The added bonus is that OneNote syncs with CCPS’s online gradebook (i.e. PowerSchool) and teachers can enter grades right into the gradebook from OneNote Class Notebook. Students are able to access and complete assignments without internet access. 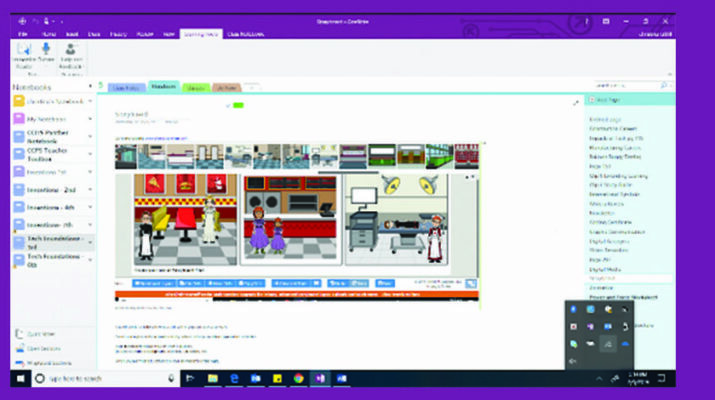 OneNote will save any work the students have entered and sync it with the teacher’s notebook when the student’s computer connects to the internet. Communication is another reason CCPS likes OneNote. It not only allows an organized way for teachers to provide content and information to students but also allows teachers to communicate and share documents with one another. Also, many of the teachers like to record messages and provide instruction on the days they are absent using the video feature of OneNote. Differentiating learning has also been made a little easier with the use of OneNote. Teachers have the ability to distribute assignments to the whole class or just a select group of students. Each student has their own individual folder in each teacher’s notebook that only the student and teacher can view. The teacher can provide feedback on the assignment that is only available to the student. Feedback can be conveyed in many forms including, text, video, audio, badges, and stickers. When it comes to sharing content with students, there are many types of materials that OneNote allows you to use, including visual, audio, text, presentations, videos, and links, Quizlet, Desmos, Geogebra and FlipGrid. Students can create content that can be shared with the rest of the class as shown below. 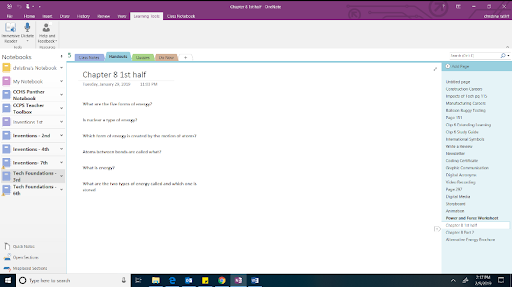 OneNote also offers students learning tools to read and dictate information for and into their notebooks, and it has other accessibility tools that are available to students. Christina Ratliff has been a CTE teacher at Charles City County Public Schools for 8 years and has taught a total of 11 years. She is a graduate of Longwood University and a certified Microsoft Innovative Educator. Jennifer Richardson has been the division ITRT for the last 13 years. Prior to becoming the Instructional Technology Resource Teacher, she was a social studies teacher. She is a graduate of Christopher Newport University and Virginia Commonwealth University. She is also a certified Microsoft Innovative Educator.